“The Migrant – Sooty Falcons in Oman” is the title of a nature documentary which has been produced by INTEWO and which has been launched in March 2017 in Muscat in the presence of H.E. Sayyid Khalid bin Hilal Al Busaidi, Minister of the Diwan of Royal Court and other VIP guests. A dedicated webpage is providing a wealth of information about the movie and offers different options to see and buy the movie, including video on demand. The global population of the Sooty Falcon is declining. The Office for Conservation of the Environment (OCE), at the Diwan of Royal Court Oman, initiated a research program together with international experts, the goal of which was to learn more about this unique bird of prey and to protect its future. 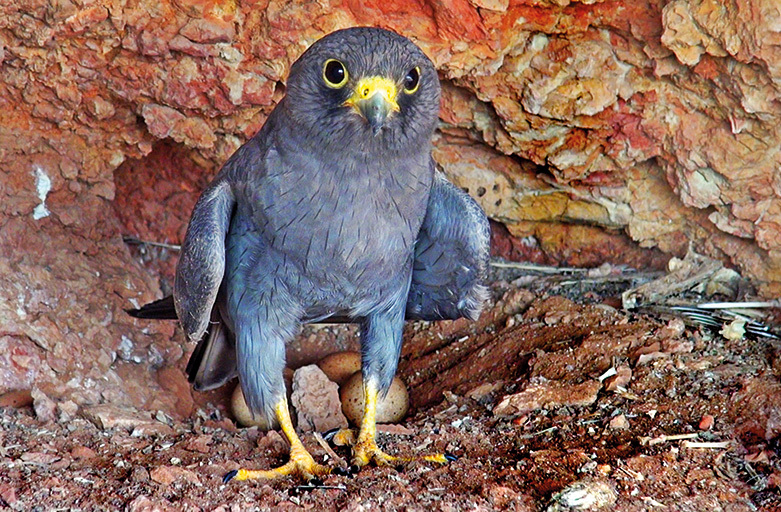 A German-Omani team of nature filmmakers accompanied the OCE scientists at work and thereby experienced the life cycle of the shy falcon at close-up range. This unique and fascinating nature documentary results from the application of a new type of camera technology. “Robin Jähne and his colleague, Sarah Herbort, were a team that had already been distinguished numerous times internationally for their nature films and that we were able to engage,“ explained producer Henning Schwarze (INTEWO). Schwarze, also from Germany, has worked together in the past for several years with the nature filmmakers. He, together with his Omani colleague Khalid al Toubi, form the production team, which is responsible for the project. The background: the latest studies show that the world’s population of Sooty Falcons (Falco concolor) is diminishing greatly. One tenth of these birds breed on islands and cliffs of the Sultanate of Oman, in the eastern part of the Arabian Peninsula. Reason enough for the OCE scientists to institute an international research project. Among others, the goal was to develop measures to protect this unique bird of prey. “The film shows the wildlife and nature through the flacon eye, and the various landmarks during his long journey. The Sultanate of Oman is an important habitat for the falcon in a sensitive period in its lifecycle”, commented Dr. Mansoor bin Hamad Al Jahdhami, OCE Project Manager. “The movie follows the work of the researchers. Above all, however, it is a nature documentary that displays not only the life of the Sooty Falcon, but rather also its integration into the environment,“ explained Henning Schwarze. Among breathtaking landscapes, the fascinating coral reefs that surround the Daymaniyat Islands on which the falcons are breeding are also a part of the story. Cameraman Robin Jähne’s equipment therefore includes the appropriate diving equipment in order to also capture the underwater world – the food source for many animals on the island. The falcons themselves feed on migrating oscine birds. When the prey’s migration is over, the falcons then fly to their winter quarters. The Omani scientists outfitted some falcons with GPS transmitters and were thus able to follow their migration on the Arabian Peninsula, which first leads over rugged mountains and the Rub Al Khali, the great sand desert, and finally extends across East Africa to Madagascar. The Sooty Falcon enjoys rich feeding there in winter – with migratory locusts finding themselves primarily on the menu. The film team followed the falcons on their travels, stopped in Ethiopia, and finally reached Madagascar. “We are lucky to have been able to capture some images that have never been filmed in that way,“ said Robin Jähne. One example is a time lapse of the view of a Sooty Falcon from the crown of a massive baobab tree on the west coast of Madagascar. It is always fascinating to see how close the audience apparently is to the animal protagonists, including during feeding. “When the falcons go so far as to sit on the camera in the process, this becomes our greatest compliment – it actually shows that our technique does not disturb the birds and the camera is accepted as part of the surroundings,“ according to the filmmakers. But there can also be times when the young birds toss the camera over, but this then becomes an interesting scene in the movie.